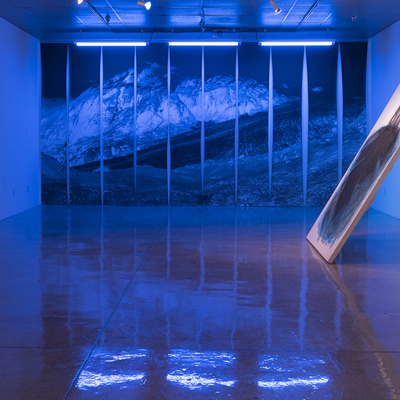 The multi-media works in A Geology of the Senses put into motion several embodied ways of relating to moving bodies of ice, and considers the senses as pathways of extraction and absorption. Proposing the human organism as geologic, and the senses a form of extraction – the question remains, if the sensorial subject is an instance of the land, then where is the individual? Where and when does vision, and the rest of the senses, slip into the geologic? A glacier listens, mountains walk and waters attend the sun. Relationships to place, geologic time and climate change operate sometimes indiscernibly on our perceptions in fluid exchange. Vision eavesdrops the creep of ice. The aural envisages beams of light. An unknowable and uncontrollable longing explored with processes of melting and chemistry. Material-loaded ice melts onto the canvas. Chemicals meet the solar to develop the painting’s outcome. Light and ice exchange positions. A glacier is a way of seeing. Time’s blue distance – a faded reservoir. Inspired and rooted in time spent alongside glaciers, Nunatak speculates on the imperceptible depths and conceptual linkages of glacial ice by way of imaginative, sensorial encounter. Photographs are troubled by painted overlays and scratches, wandering marks swarm their surface. Melting ice extends the crevasse. Silt and debris spill over the edge. Layers amass and dissipate, traces are littered and carved. The past can’t be seen and the future doesn't know where to go.